Your articles are thorough, well researched and well written. A delight to read. As I’m in the ‘commo’ stage of my prepping, this series of articles is particularly helpful. Can’t wait to read your promised article disclosing your recommended GMRS radio. It has excellent reviews and a great price. Though I mounted mine on the roof, you can see it may be rolled up for portability and just hung from a tree when you get to your retreat or camp site. I now have an article that points to an alternative to the Slim Jim antennas – those made by Ed Fong. If you move down this article you’ll see links to four articles explaining the special features of Ed’s antennas. I have one of each of the two types Ed offers and like them very much. That’s not to say that the N9TAX antennas aren’t also good. They are certainly well known and popular; but my guess is that if Ed’s products were better known, they’d be much more popular too. Just want to give you some clarification… Above in the section about SWR, you mention 2m band as being 420 to 450mhz That’s incorrect. 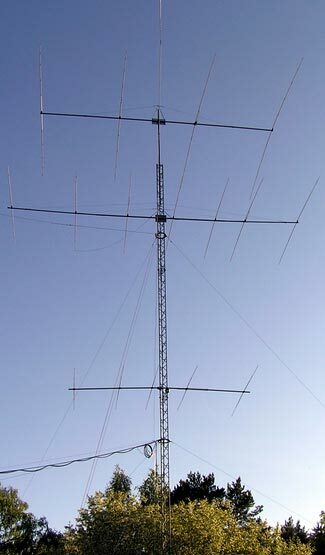 420 – 450mhz is in the 70cm band. Otherwise great article. Thank you. On antenna’s I do have a Pryme AL-800 for my uv-5r it’s an extendable and the range is phenomenal 20 Miles in hilly forested northern Maine. Thanks for writing, and thanks also for being the first person to spot the 2m/70cm ‘typo’ in the article, which I’ve now corrected. The antenna you mention (which is also sold under several different brands) is interesting. Readers should note that you may need an adapter between its BNC connector and whatever your radio has for its antenna output (in the case of the Baofeng UV-5R, it is an SMA-F). I’ve not used one of these antennas myself, and would worry a bit about the fragility/stress of the antenna and its mount to the radio. When you talk about its 20 mile range, what is the radio you are talking with at the other end? Have you also used other antennas to compare the Pryme to other antennas? Here’s the Amazon link to the Pryme type AL-800 antennas. Today I saw one for just under $40 and another for $20.